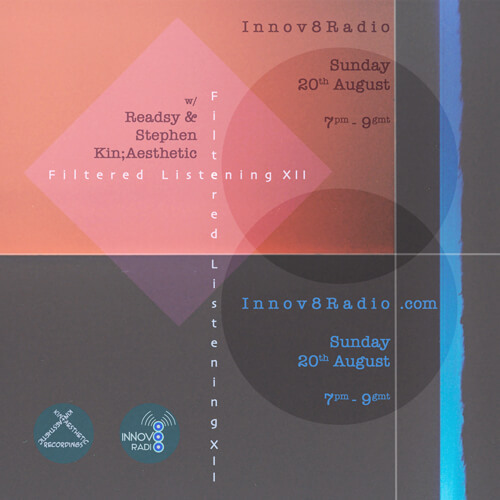 A pleasure to have Colin 'Readsy' Read bring some of his sharp vinyl skills and selecting wisdom for Filtered Listening 12, joining Stephen for a bright opening flare of boogie, disco & p-funk before laying into a drowsier second half groove. Featuring a whole bunch of cuts glowing with masterful mix and production work from the likes of Bernard Edwards, Nile Rodgers, Francois K, Quincy Jones, Roger Troutman, George Clinton, DJ Shadow, and Dennis Bovell. This DJ pairing stretches back 15 years, running various loosely themed 'play-what-we-fancy' nights starting in Kingston, UK circa 2002 and catching up on the decks here and there ever since - the shape of those nights brought a definite influence to the 2x2 off-the-cuff dueling (Noah's Ark style - as coined by Colin!) of these shows, so it's brilliant to welcome Readsy along to recapture a little of that history for the Filtered Listening show. Shouts to Innov8 for the usual support and broadcasting, and also to all who DJ'd, danced and organised at Cowley Club to celebrate Pride, a brilliant night with a few sounds from it cropping up here. Readsy's hand-themed 5:5:5: piece, celebrating 5 carefully chosen game changers from the 5 NYC boroughs. That'll be up and live on Sept 5th at 5:55pm GMT.